Vintage Clothing Blog | Vintage Wedding Dresses | Salvage Life: Should I fill the prescription on these vintage frames? 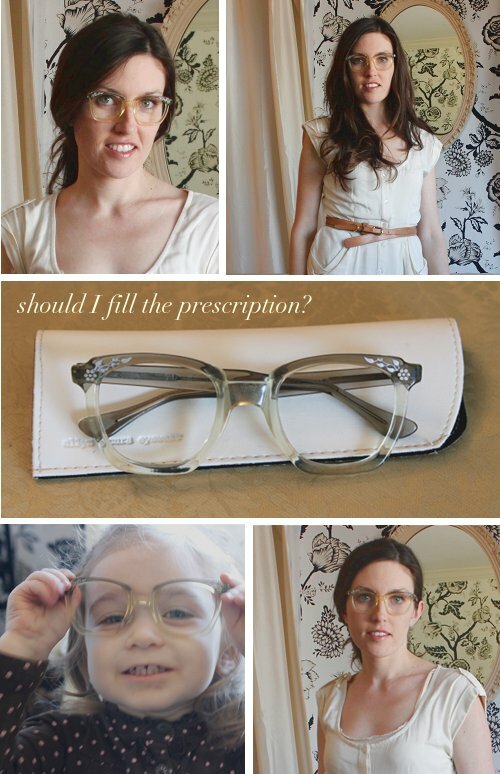 Should I fill the prescription on these vintage frames? Jeff and I spent the weekend away, just the two of us, which was really nice. It is good to be home though, I missed my baby and my business! I've been meaning to post this since I found these glasses a few weeks ago at a vintage show (via allen scura). I have been needing new frames and I am always looking for new categories of items to buy used/vintage. It was funny too, I probably tried on 20 or so frames, but these were the first pair that caught my eye, I just love the etched flowers. Ruby seems to like them too. :) What do you think of these on me? I'd like to get some feedback before I fill the prescription. Have you or would you consider buying a pair of vintage frames? i would def do it! i love this idea. how fun to have a pair of vintage frames that no one else will have? very unique. those look great on you, too. heck yes! i bought vintage frames and put my prescription in them and they are the glasses i love best. Totally do it! I just bought a new pair of glasses, but now I'm sad that I didn't think to find some vintage ones. Darn it! They are gorgeous, I say do it!! I would now. Wish I did recently. Oh, well, next time. They look very nice on you, Beth. I like the flowers, too. I think you should def fill the prescription! I have never tried vintage frames but I have seen so many great ones around the blogworld that I will def be on the lookout next time I need to get new glasses. Love the idea of vintage frames, but I think a different shape would be more flattering - perhaps a more elongated shape, rather then this squarish shape? 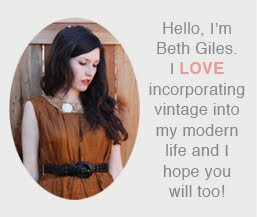 I love vintage but I agree that you should try another shape too! Just to see which you like best. Play with it awhile before making a rash decision. I like the shape and they can go with practically any look. I had vintage frames many years ago and I loved those glasses because that was my look back then. I would just make sure you put them to the test and make sure they fit well. Nod, shake your head, lean over, lie down, etc. If they fall off, make sure that they can be tightened easily.